Quote: in the end we mux them together aren't we? and looking at your media info, the audio should be extractable along with the video..
but i'm actually impressed that someone used Hi10@L5.1 - playback gonna little hard on old machines. and then it made me intrigued - how the hell it can be done. anyway, how did you recode the video? hd extractor only used for extracting subs. i personally never use it to extract audio or video stream. 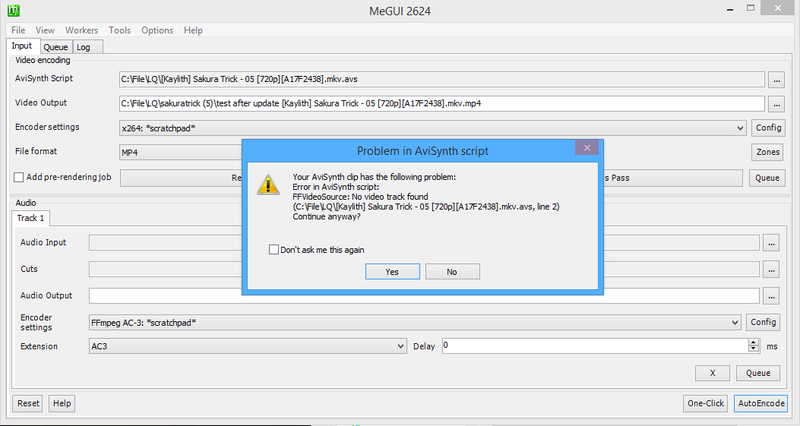 then move on avisynth script creator (ctrl+R). muxed video as input. dialog box appears, choose file indexer. choose FFMSIndex and select audio tracks. then avs script creator window + preview opened for customization. (26 April 2016, 01:15 PM)undead098 Wrote: hd extractor only used for extracting subs. i personally never use it to extract audio or video stream. ok i tried it and it works without problem. (27 April 2016, 05:29 AM)undead098 Wrote: ok i tried it and it works without problem. what the heck.. so, i'm not wasting time by rebuilding the tools manually..
By the way, is there an option for Unix OS or mac OS?